The Edible Schoolyard Garden at AOSR started in 2008 after Alice Waters’s inspiration and the hard work of parents, teachers and students. It is active and producing for the whole school year. Part of the garden is dedicated to planting aromatic herbs, and the rest we plant rotating seasonal crops with students. Our organic crops have been featured in the cafeteria and enjoyed by our students. We plan to incorporate our own production more frequently in the school lunch. As an international school, we are vested with the responsibility to nurture lifelong learners who are conscientious global citizens. 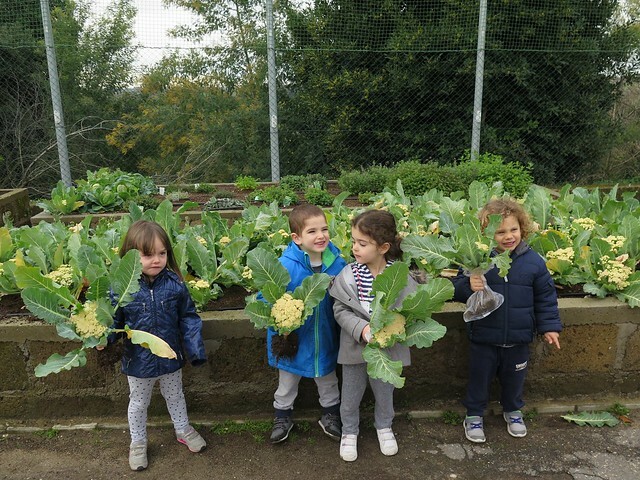 The Edible Schoolyard Garden at AOSR offers authentic, interdisciplinary educational activities to develop the knowledge and life skills that help students make responsible choices on sustainability. The Edible Schoolyard Garden is an integral part of our curriculum and a model outdoor classroom in which students learn how their food choices affect their health, their communities, and the environment. The Edible Schoolyard Garden is an open-air learning space for all grade levels. Teachers and students are free to utilize the space as extensions to their classrooms to perform cross-curricular learning activities. Students enjoy planting, drawing and writing about the crops, and performing scientific experiments and monitoring growth. They gain hands-on experiences while excelling in language arts, visual arts, science, math, and social studies. Our Edible Schoolyard Garden brings the entire AOSR community together through fun learning opportunities. The Garden Lessons are made available thanks to the dedication of many players, starting with Ms. Marta Rahm, Secondary School Librarian, and Ms. Eva St. Onge, Secondary Science Teacher, and including Ms. Rumsby, Grade 5 Teacher, who has been supporting the Garden and involving her 5th Graders in planting, harvesting and participating to lessons for many years now. A special thanks also goes to Dr. Bruno, our Director of Finance and H. R., and Ing. Piccioni, our Facilities & Maintenance Supervisor, who have always been very supportive of the Edible Garden for many years. Our Edible Schoolyard Garden on Flickr!